Access your desktop computer, browse & share your files. Is there a better alternative to Remotely? Is Remotely really the best app in File Management category? Will Remotely work good on macOS 10.13.4? 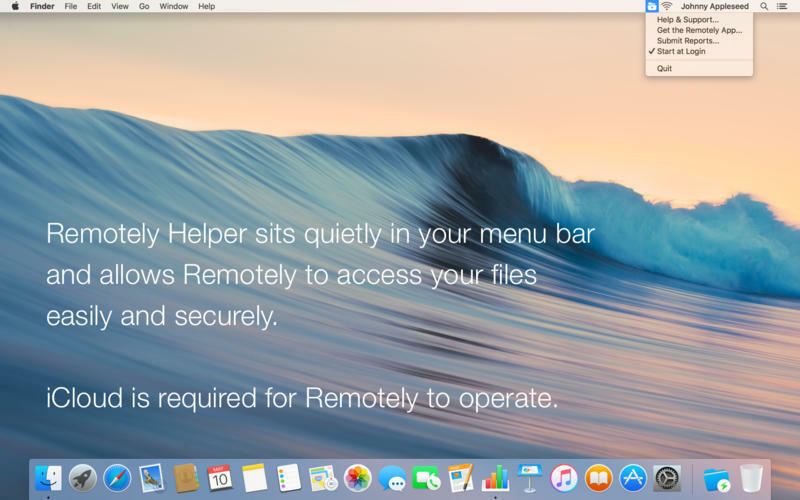 Remotely allows you to connect your iPhone to your home or work Mac from anywhere and browse all of your files. No port forwarding or configuration required. Never be without that important file- just connect to your Mac; browse (or search) for the file you want; view, share, or even download it. Remotely also provides quick and easy access to your most recently accessed files - see recent and flagged files from the Remotely menubar menu. Remotely needs a rating. Be the first to rate this app and get the discussion started! Hassle-free configuration. Install the helper on your Mac, open Remotely for iOS and bam, your Mac is there. No ports to forward or firewall exceptions to configure. I won’t say it’s magic but it’s magic. Access most recently opened and flagged files from the menubar. Browse folders & volumes as if you were sitting in front of your computer. Documents, Downloads, Desktop, Music, Photos, Devices… it’s all there. View all types of files. Office, iWork, PDF, crazy video formats like mkv or whatever. There’s a full list on the website. Download files for offline viewing. In case your Mac isn’t available, or you’re in a tunnel or on an airplane or in the desert and you need that super important document. Email your files as binary attachments, or share them however you like using the native iOS share pop up thingy. Crazy secure. Your device is connected directly to your Mac over an encrypted connection. Your files are not traveling through someone else’s server, ever. Full Spotlight search with file type filtering. Again, just like you are sitting in front of your Mac.